Do you ever feel as if you're in a never-ending battle to keep your kids happy, healthy and safe? Welcome to parenthood! You’re a watchful protector, just waiting to swoop in and sock it to the everyday super villains that stand in the way of your children’s health and happiness. Some of these lurking dangers are easy to see and prevent, (the anxiety of school or the looming threat of a bully). There are, however, hidden threats that are invisible to the naked eye but are nonetheless lurking in your home waiting for their moment to strike. Worst of all, they’re hiding right under your nose. Regardless of how much care and attention we put into the food we prepare for our families, it’s our duty to remain vigilant against microscopic malcontents and keep them out of our kids’ bellies. When I recently met with a nutritionist for my own diet needs, she opened my eyes to a host of food-borne bacteria that generally pose a marginal threat to adults with robust immune systems but can cause serious trouble for little ones whose immune systems are still developing. Listeria is a common bacterium that’s present in all manner of fresh foods, even foods many of us consider safe. In fact, it’s the reason why cashew butter was recalled. When ingested, it can cause a serious condition known as Listeriosis. It can infect vegetables by lurking in the soil and water that nourish them, it’s also present in animal products such as meat and dairy. A tenacious enemy, it can even transmit from contaminated to uncontaminated foods. Pregnant women and newborns are particularly vulnerable to listeria. Infection in pregnant women can even lead to miscarriage or stillbirth. Thoroughly cook all meats and cheeses. Wash raw vegetables before eating them. Avoid all unpasteurized dairy products. Wash your hands and utensils after preparing uncooked foods. Consume your perishables as soon as possible. One of the most common of the kitchen dwelling bacterial bad guys (and one of the most potentially dangerous), salmonella is also largely associated with animal products. Salmonella infection usually takes place when eating food that has come into contact with the feces of animals or humans who carry the bacteria. While salmonella infection usually takes place in meat and eggs it can also infect vegetables. Salmonella poisoning is especially harmful to children and the elderly. Typhoidal salmonella, while rare, can cause typhoid fever which can be fatal. Do not cook raw meats in a microwave (it could result in uneven temperature or a dangerously low internal temperature). Avoid bringing uncooked meat with raw foods that will not be cooked (e.g. salad leaves). Wash your hands after handling household pets. Wash your hands before preparing food and after handling raw meats. Public enemy number one! 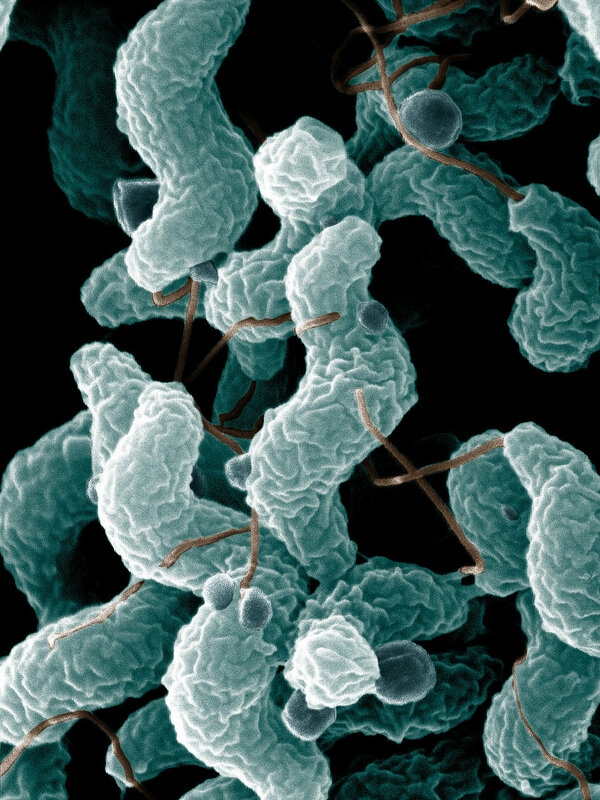 Campylobacter is the most common cause of bacterial food poisoning in the United States. Like salmonella, it spreads when food comes into contact with the feces of animals that contain the bacteria. It is most commonly found in chicken and other poultry (in fact, studies show it’s been found in as many as 88% of chicken carcasses). Campylobacter poisoning is most common in children under 5 and young adults aged 15-29. When cooking poultry ensure an internal temperature of 165 F (74 C) at the thickest part. When transporting meat and poultry try to ensure that they remain in a cool place. Do not use unpasteurized meat or eggs. Avoid leaving uncooked foods out at room temperature for two hours or longer. Never cook stuffing in the carcass (no matter what tradition says). Wash all fruits and vegetables carefully and thoroughly before eating. These three foul offenders lurking in your food that could do serious harm if left unchallenged. Just this morning I was reading about an E. coli outbreak here in the States. Be vigilant and cautious. Every super parent needs to rely on help every now and then. Make sure you consult your doctor as soon as you see any of the symptoms of any of these infections in your kids. Most of them tend to pass with time but it’s always worthwhile to enlist the help of a medical professional to make sure they don’t get worse.